It seems to be that Beyonce is a highly productive person in the amount of hours a day that we all share, and you know what? You can be highly productive too! Now, I am not aware of Beyonce’s daily schedule or routine. I am sure she affords some luxuries that maybe you and I aren’t quite able to afford…yet…. but I believe we are able to get ourselves into a routine or a habit, that will help us to be our most productive selves and still allow for down time and time to take care of those things that we wished we had more time for. Not sure if you have noticed, but I am a huge fan of GOALS! Not like sports goals… I mean sports are cool and all, but the type of goals I am into are the ones that we set in order to do something different. Setting goals in order to help achieve positive change is what I’m all about! So I believe, in order to make a change in your life it takes time, it takes effort, and it takes having a plan. We have that ’T’ word again…..TIME…. it takes time to set a goal, but we don't have time!! What a conundrum…(that’s a fun word)! 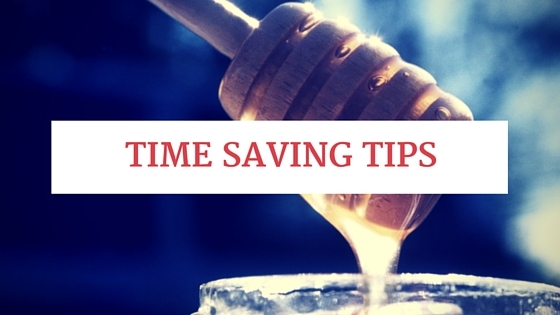 Let me give to you, some of the best time saving tips that have worked and still work for me to keep up with my goals and keep me from feeling rushed in my daily routine. Okay these make a lot of sense to me, but let me break them down for you a bit more. The Daily Routine- take a look at your day and figure out when you need to be where. For example, if you have to be at work by 9am and you know it takes you 15 minutes to get to work, but you'd like to be there a little early and it takes you an hour to get ready but, you also like 15 minutes to just sit and drink coffee in your undies, schedule that ish! Wake up at 7:25 and make it happen! Try to schedule your entire day eating, sleeping, cleaning, monthly tasks, working out, chillin’, include all of that in the schedule and put a time to when you do each activity. The way I like to look at to-do lists is big picture and little picture tasks. With the big picture, I list all of the things that need to get done in the month. Trips planned, expenses, gifts that need to be bought, appointments that need to be made etc… With little picture, I prioritize the big picture and break it down to 1-3 tasks per day that will get me to reaching the big picture tasks. 1-3 per day are a lot more manageable then trying to do them all at once, and since you already designated a time for tasks in the previous tip, you have time in your day to get these accomplished. Clothes are good- so I have a hard time with clothes in general, but we have to wear them, for most situations, so what I have done was designate Sunday as a day to choose my outfits for the week. I scheduled the time in my daily routine to spend sorting, and even trying on outfits to make sure they look right before the work week starts. This is so simple, and so time-saving. I no longer leave my house for work 5 minutes late and on the verge of tears, in high-water pants and wrinkled tops, because everyday I know my outfit matches, it fits and it looks great! Meal prep whaaaaat?- oh my apple pie (which sadly is not on my meal plan), meal prep is so amazing! Okay another activity I have designated for Sundays and that is so so so amazing and worth it! So here’s how it works, pick a day, get some tupperware, and cook enough meals to last you the entire week…. whoa crazy! Even if you just packed lunches for you for the entire week that you just grab in the morning before heading out, how amazing and time-saving that would be! I have been meal prepping for two, my hubby and I. I cook enough food for us to have lunches and dinners for the entire week, which leaves us so much more time to just hang out and be with each other! Cleaning can be cool- for some people cleaning is awesome, it is a way to de-stress and to relax, but for me, cleaning is the #worst… but it’s gotta get done! Sooo what I have found to help me is to set up a system. We go back to the daily routine now, and make sure you pencil in some time for the cleaning. Next you need to think about your home, or space, and what chores need to be done on a weekly basis. Set up a weekly schedule, or chores chart for yourself and/or people you live with print it, post it up somewhere and trust me, if feels so good to get your stuff done and still have time to just……. be. Hey, like any habit, it does take time to get into the routine of things so in this case, it takes time to make time! And when you have more time, fill it with the things that make you smile. Want more planning and goal setting tools? Subscribe here to get the Goals Guide to help you get started today!